A complex society needs clear property values but the avoidance of over-concentration of wealth. It needs open mechanisms of resource allocation, predictable institutions for dispute settlement and regulation, predictable values against which these are calibrated. The terms "open" and "predictable" must apply to more than a minority, or the majority will surely be manipulated by those in the know. Such a society also needs to be safe, healthy and internally stable. Its economy and administration needs access to motivated and appropriately educated human resources, rational capital and world-standard knowledge bases. Its elite industries require immensely complex intangible infrastructure. None of those are choices. They set the current preconditions for wealth generation. The economic surplus is split between the private and public spheres, and the public sector uses this income - and, alas, borrowing - to fund these public goods. One of the public goods that the state buys is social consensus. It does this directly through subsidy to the young, the old and the less wealthy and indirectly through the purchase of or defence of public goods. This is extremely expensive. The pressures to limit state spending are clear. The demands of competitiveness and the facts fo demographic change will place huge pressure on existing pattersn fo subsidy. This note asks what this means. What is involved in "managing social consensus"? The notion of consensus is chiefly defined in the negative - by the lack of friction or by the repression of those with alternative views. An oligarchy which managing a society by force will feel that there is a fine consensus in place. A society which is in the grip of an extreme political movement will feel that there is a consensus, but that "it is unfortunate that those traitors do not agree with it." Many - perhaps most - societies have a range of notions about what is right and proper in play, varying with age, gender, social class, religious affiliation and so forth. Narratives, stories that societies tell themselves about what is right and proper, and how things are to be done, are often confined to sub-sections of a nation. Indeed, nations are often a patchwork of very different people, held together by a largely fictional national narrative. "Consensus" constitutes the glue needed to hold this diversity together, against whatever centripetal forces may be at work. It is emollient to points of extreme potential friction. Societies which lose consensus may find that they are suddenly cohabiting with strangers, a recipe for conflict. In the Twentieth century, it is estimated that around 220 million people died in conflict. Around 20-30 million died in wars between states. About double that died in civil war. The remainder were killed by their own governments, chiefly through artificially-induced starvation. Consensus matters. The nature of what constitutes consensus is defined by the character of the narrative that is in play. If a society sees itself as a consortium of equal partners, then the recipe for consensus will reflect this. By contrast, however, the "natural" model - everywhere prevalent before the Eighteenth century - was much less inclusive. It was dominated by both large economic and cognitive disparities, by early mortality amongst the poor, by the extensive use of minimal skill manual labour and by private and religious charity. Revolt against the status quo was repressed by force, or else succeeded and so replaced the old oligarchy with a new one. Nevertheless, it was generally held that the world was innately violent and coarse, that people needed to be controlled by strong government, and that improvement could be obtained only in the spiritual realm. New ideas appeared in the Eighteenth century. Progress was possible. Government and commerce could improve life for a broadening class of people. The tools to use were knowledge and skill, analysis and autonomous judgement. Everything - health, poverty, social problems - were tractable to insight. As larger communities formed, so the new problems that they presented were managed, from drainage to policing. One such problem - encountered by Chinese and Byzantine emperors as much as Nineteenth century governments, was that of social instability, of "the mob". This had always drawn a common response - subsidies, distractions, repression - but Nineteenth century Europe, in particular, took a more thoughtful posture. This was the age of nationalism and empire, and countries needed a national focus - a consensus - to meet what they saw as their sovereign tasks. They needed to actively manage a national consensus. The state was to be the stern parent of the national family, dispensing presents and punishment in harmony with a national ethos, to which all were to subscribe. The nation was to be a single community, where there had previously been only fractured groups. This attitude and piecemeal additions led directly to what might be called "Welfare I". Welfare I arose within the heavily industrialised societies. Many countries had an alientated but essential, untouchable urban proletariat. This was extremely aware of class distinctions, was much influenced by foreign ideologies and was capable of bringing the entire engine of commerce to a halt. In World War II, for example, US support to Britain was halted twice by union action explicitly supportive of the Hitler-Stalin pact. The depression years had weakened loyalties to national flags in favour of international movements which had more resonance with the urban poor. The Nazis had arisen from much the same populist movements that were prevalent in every democracy. Communism was exploiting similar notions. War experience had led to a death of deference, and had shattered parochial narratives. Many were now wary of official truths and ex cathedra pronoucements by authority figures. The near-universal response was to upgrade the Welfare I model. Much effort was put into the re-establishment of a narrative of freedom: the state as the sole provider of univeral access to health and education, the state as a supporter in times of adversity. The war had taught planners how to think on a grand scale, and this was put to work in fine detail. Nutririon was to be managed, babies monitored, the population innoculated, parents and children assessed. Few recall that the US implemented a universal mental health system, with everyone expected to be assessed and "processed". Above all, there was a commercial-national narrative that grew to be the national ethos, supported through all media, imposed by the normative values of a population exposed to five years of intense regimentation by war. Welfare I does, however, exhibit a powerful ratchet mechanism. Existing measures are hard to reverse, and new measures are a politicians' bait on the electoral hook. As a result, it tends to consume increasing fractions of gross value added. Instead of melding the society into a common unit, it supports the emergence of a wholly dependent welfare class, often permeated by crime, psychologically and physically isolated from the remainder of society. It is, perhaps, worth mentioning that there was another approach to welfare in play after WWII, often called the Scandinavian model. This was mediated by the state, but was primarily a form of community support. It appears to be the natural product of societies with a strongly collective tradition, itself perhaps due to mutual reliance during deadly winters, perhaps to ethnic homogeneity, perhaps to the very late emergence of a strong middle class. This model is much less prone to place its poor in ghettos, but it can be intolerant of ethnic diversity. The first welfare model was in considerable trouble towards the end of the 1980s, but was rescued by the long boom. There are many sources of concern. The scope and ambition of every program is driven outwards. This is particularly true in areas such as medical care, where potential spending is unbounded. New treatments appear daily. An ageing population that is in need or chronic care replaces a young population in need of the occasional intervention. Health extends to encompass personal care, counselling and issues of housing and personal finance. All of this is driven on and made more costly by the fear of litigation, by media-generated "scandals" and by political promises. Welfare that relates to low incomes has been particularly effected by a different phenomenon. Real wages for the low-paid ceased to rise in real terms at the end of the 1960s in most industrial countries. This was first due to a combination of the changing industrial portfolio and the automation of systematisation of many jobs. That is, mass manufacture declined as a proportion of overall value added in most countries, but employment in manufacture fell still faster. The later trend resulted from outsourcing, first nationally and then to low wage areas. Many grossly inefficient state industries were privatised in the 1980s, destroying huge numbers of low skill jobs in the process. During the 1990s, market pressure intensified just as international outsourcing became cost-effective, and when IT finally delivered on its promise. In addition, a large number of women now entered the labour force, often displacing low skill men and significantly increasing the labour supply. The likelihood of a low skilled individual finding a full time job declined continually, and what jobs there were paid low wages. They were often taken by immigrants from low wage areas, for whom the pay was princely. Politicians met this issue in a number of ways: by expanding the budget, by hiding unemployment under other headings, such as disability or early retirement, by creating tasks in the public sector that absorbed labour, and by encouraging part time work. The fast growth of the economy masked this, cheap capital helped to fund it, and the problem was concealed. Real wages for low skilled individuals fall precipitately, to "immigrant equivalent" levels. This has already partially occurred in many European countries. Political pressures mount for protectionism. Where successful, the results will be locally damaging and if general, globally catastrophic. There is a 2B option, which is to combine this with heavy taxation on wealth. We will discuss this below. We learn to buy social consensus better than we did in the past. More complex analysis extracts three factors within the data that have been collected. Only one of these dimensions - the one defined by the elements shown in the figure - relate directly to "contentment". The second factor clusters together measurements that can be read as relating to middle income stresses - assault rates, role of social networks, educational attainment, unemployment, air and water quality, a sense of not being consulted. The third cluster, of limited statistical weight, relates to job insecurity and long term unemployment, with the sense of not being consulted also included. 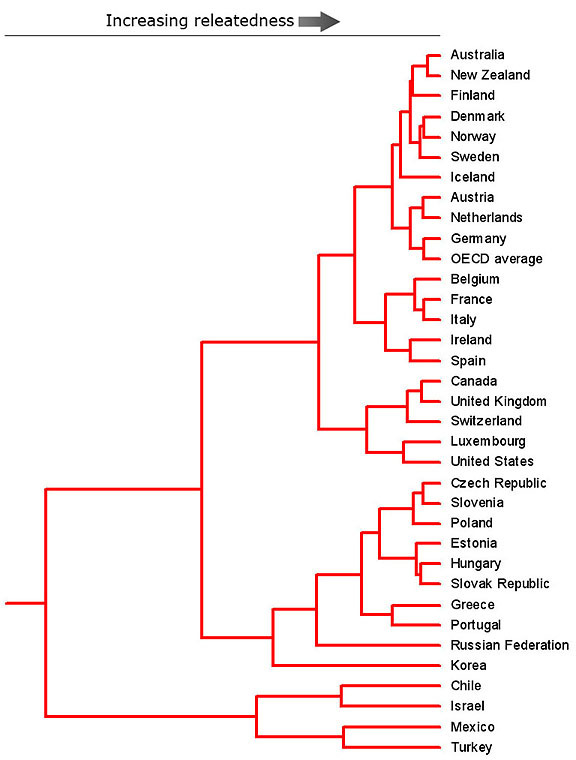 Collectively, these factors make a good job of explaining variance in the overall data, and allow us to break nations into families as shown in the figure below. This may, perhaps, tell us two things. First, national clusters reinforce our stereotypes that contentment comes from genuinely different national accommodations. Second, contentment is chiefly related to economic success, and discontent to the insecurities that come from a lack of it. That tells us that although it may be possible to mildly improve national content without getting richer, there is no silver bullet that we have missed unless, that is, we have all of us missed it. Certainly, national differences in ethos are completely swamped by national differences in wealth when it comes to assigning content. Some nations - Chile, for example - are happier than it ought to be; but it is questionable whether Chile has a secret from which the rest of us can learn. Earlier, we mentioned a 2B option, which was markedly increased taxation in order to extend welfare from the proceeds. 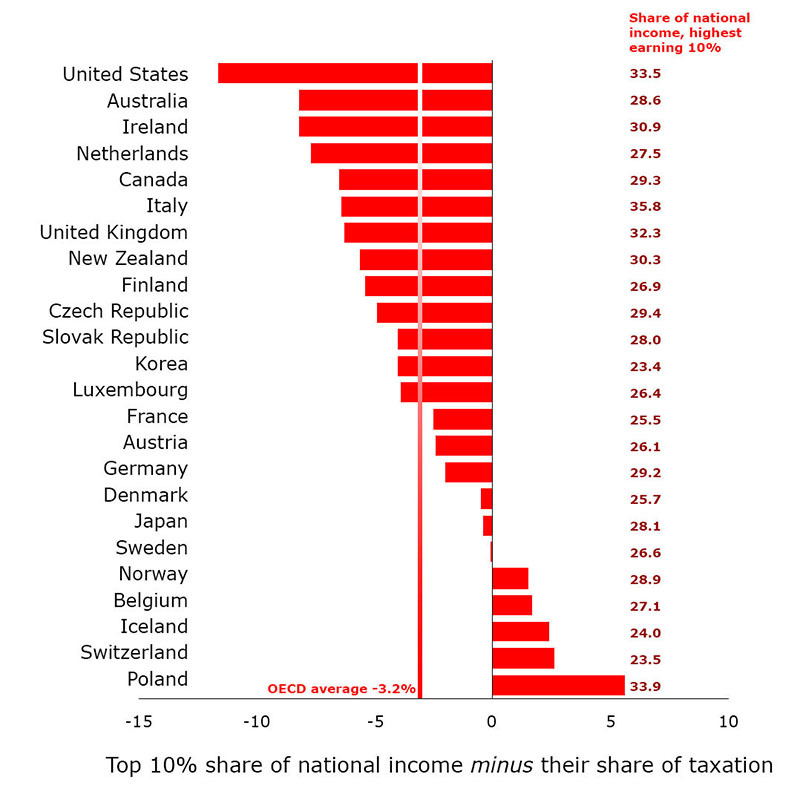 The US, as the least "equal" of developed nations, already has remarkable progressive taxation. The figure shows the proportion of net income earned by this group minus the proportion of the total tax income of the state which they pay. The top 10% in the US took around 33.4% of national income in 2011, and paid 45.1% of the taxes, for example. However, when the focus switches to the top 1% of incomes, these do not contribute proportionately. Their proportion of national income peaked in 2007, at 23.5% , equivalent to the figures in the early 1920s. The lowest figure in the past century was reached in 1976, at 8.9%. Growth since then was broadly linear, reflecting the forces discussed above. Increasingly strong political movements demand what they see as redress. Sharply progressive taxation is the machine to achieve this. Two arguments are advanced to this end. First, the vague notion of "social justice" or, as the reader sees fit, the desire to raid other people's pockets. Second, the more rational argument that the wealthy do not circulate their money as fast as lower income groups, and so add less to aggregate demand. Arguments against such a raid include: That high incomes are often episodic, and not a long-run feature of life. Taxing them at peak is a disincentive to peak performance. The disincentive argument is used more generally, to say that great prizes attract great efforts. This may well be so. However, it is not at all clear how great the prizes have to be in order to generate that effort, or for how many generations such a prize should be held. This is, essentially, a cultural choice. That said, the entire earnings of the top 1% would not pay the welfare deficit and a significant raid would, undoubtedly, lead to less wealth generation in the long run, either through migration or disincentive. Option 2B may well be enacted, however, but it will not solve the problem. A note on individual earnings: The rationale that we use for how much wealth sticks to which individual is more a matter of custom than conscious design. There are elements of skill scarcity, of entry barriers and collective bargaining - at board level selection and remuneration committees as much as through trades unions. All data show consistent returns to skill from whichever period they are measured in. Wages in highly complex and technified activities are generically higher than those in less complex industries. There are inter-sector norms that may differ sharply, often when the industry is transnational and wages have to track the highest income country. Equally, there are elements of risk taking and luck: entrepreneurialism is the way to make a truly great fortune, or lose one; and skill counts for a great deal in this. However, nothing beats being in the right place at the right time, with the right outlook and the right skills. But that is a tautology. There is a further exploration of these issues here.